Theresa May has been speaking to Labour MPs and union leaders in a bid to try to get her deal through the Commons, where scores of her own MPs oppose it. Theresa May said leaving the EU provided "an unprecedented opportunity" for the countries to strengthen relations. 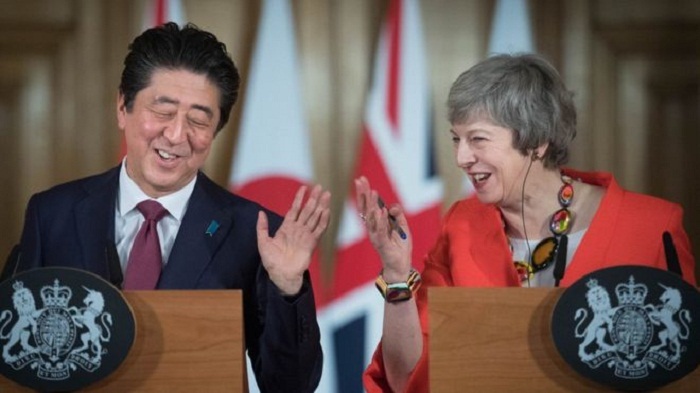 She and Abe pledged to build on the trade agreement between Japan and the EU to secure an "ambitious bilateral arrangement" between Japan and the UK after Brexit. Abe said: "It is the strong will of Japan to further develop this strong partnership with the UK, to invest more into your country and to enjoy further economic growth with the UK. The deal looks set to be rejected by MPs next Tuesday, with 110 Conservative MPs having said they will oppose it, Labour set to vote against it and Labour Leader Jeremy Corbyn calling for a general election "at the earliest opportunity" - should it be voted down. Theresa May has been speaking to some Labour MPs and the leaders of two of the UK's biggest trade unions, Len McCluskey of Unite and Tim Roache of the GMB, in a bid to try to build support for the deal. Speaking alongside Prime Minister Abe, Theresa May repeated her call to MPs to support her plan in next Tuesday's crunch vote, saying: "The only way to avoid no deal is to have a deal and to agree a deal, and the deal that is on the table...the EU has made clear, is the only deal." During their meeting in Downing Street, Theresa May and Abe also discussed a number of joint projects, including research around conditions such as dementia and heart failure, the increasing use of big data and artificial intelligence, and environmentally friendly growth.